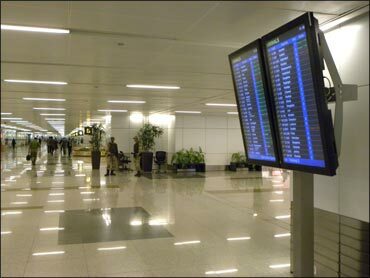 Terminal 3 of Delhi's Indira Gandhi International Airport has become the world's first and also the largest terminal building to be conferred the prestigious 'Leadership in Energy and Environmental Design New Construction' (LEED NC) gold rating. LEED NC is the certification system developed by Indian Green Building Congress for green buildings. It is the local chapter of US Green Building Council, one of the most well known, whole-building standards in the world. The rating was awarded on the basis of T3's features across six categories: Sustainability, water efficiency, energy and atmosphere, material and resources, indoor environmental quality and innovation in design. The IGBC definition of a green building is one which uses less water, optimises energy efficiency, conserves natural resources, generates less waste and provides healthier spaces for occupants, as compared to a conventional building. Rainwater harvesting or uses of natural lighting and CFL bulbs are the basic elements for achieving the green building objective. Some of the unique green features of T3,based on which it was awarded the Gold rating, are given in the follwing pages . . . 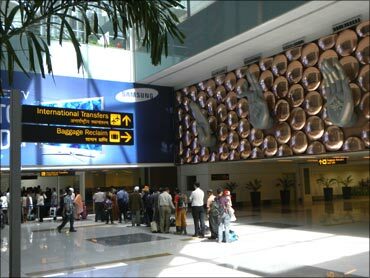 Image: Delhi International Airport's Terminal 3. Erosion and sedimentation control: Storm water drains were constructed, pre- construction to control soil erosion caused by storm water. Airside vehicles are provided with CNG refueling station. To encourage use of alternative fuel vehicles, the multi level car parking facility is equipped with 215 electric charging stations. Public transport access by development of Delhi Metro Orange line (Metro Express) for public access to IGI Airport. Rain water harvesting and 100% use of recycled water. 17 lakh sq ft of green landscape on air side. Treat and reuse the sewage. 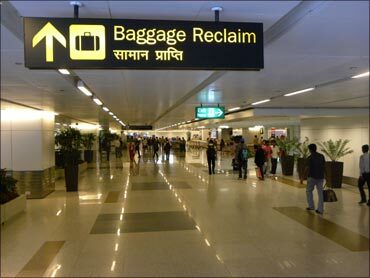 Water efficiency in air conditioning system: The entire water demand for makeup water at Terminal 3 is supplied by recycled water from the sewage treatment plant (STP). Special attention to indoor environmental quality. Daylight is a primary focus of the terminal's design. Highly energy efficient passenger transfer systems (lifts /escalators /travelators) with radar sensors. Use of 1,200 energy efficient LCDs screens for public information systems. Usage of electric/CNG vehicles on both air side and landside. The fire suppression systems have zero ozone depletion potential. Lifts equipped with permanent magnet gearless machines. Use of fire fighting system with zero global warming potential. Natural ventilation in multi level car parking building. A car-pool programme by DIAL employees. Construction waste management: More than 95 per cent of total construction waste comprising mainly of concrete debris and steel scrap has been sold for recycling. Fly ash based concrete, cement and blockwork used. Entire civil structure (except reinforcement steel) was procured regionally. There is very minimal usage of wood that has been used in the project. The areas of wood usage are toilet partitions, wooden doors and frames, counters and related accessories. Use of steel with high recycled content. Adhesives, sealants, paints and carpets specified to have low or no volatile organic compounds (VOC). Saw tooth skylighting in departure level. Departure level is 100 per cent daylit. Glass fa ade ensures view to outside. Pedimat flooring provided on all major entries. Air curtains provided at all entries. Separate exhaust for chemical storage/ battery rooms/ toilets. Sensors to monitor quality and quantity of air. 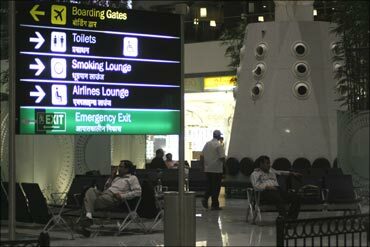 Environmental tobacco smoke control: The entire Terminal building is a declared no smoking zone. Designated smoking rooms are provided for smoking, which are equipped with separate exhausts. All adhesives and sealants used in fa ade/roof and interiors are low VOC. Paints used in building interiors are low VOC. Largest installation of CRI Certified carpets in the world. Entire range of chemicals used for housekeeping are eco-friendly and biodegradable. Water use reduction by using low flow fixtures. Recycled water used for flushing to reduce usage of potable water. 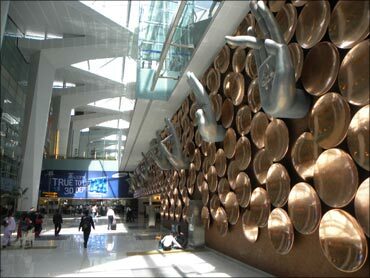 Commenting on the occasion, I Prabhakara Rao, CEO, Delhi International Airport Limited, said, "We are proud to achieve the gold rating LEED NC for Terminal 3,as it is one of the best-known green building rating systems worldwide. It is a true acknowledgement of our sincere efforts to be environment-friendly." 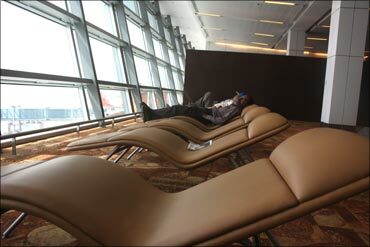 At T3, the primary focus of the design team has been on promoting energy efficiency and improving environmental quality. 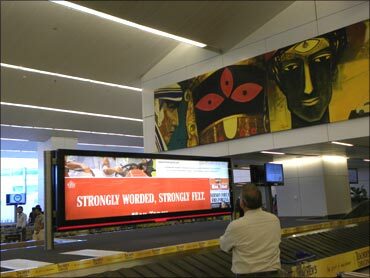 T3 is designed to be a national model for passenger-friendly and environmentally responsible airport facilities. "We have also put a lot of emphasis on rain water harvesting at IGIA. 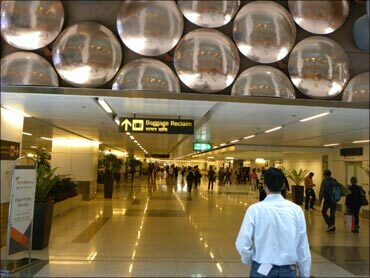 In fact, the count of water harvesting structures at the Delhi Airport have increased six times in the last three years, from a mere 50 of these structures in 2008 to a figure of 300 at present," Prabhakara Rao said.